This beach ranks #12 of the "Best islands in Baa Atoll"
Milaidhoo Island Maldives is a 5-stars boutique resort with very cozy rooms. Huge villa starts from US$1400 per night. But in reality, you should be ready to pay at least US$1700. Fly to Male international airport (MLE). Next fly by the seaplane. The flight time is 30 minutes, while the cost of a round-trip is US$540 (or US$270 for the child). For the same money it is also possible to get via the local Ddharavandhoo island. First take 20 minutes regular domestic flight, and next the hotel's speedboat will take you to Milaidhoo in a less than 15 minutes. In advanse it is necessary to give the hotel time, when you arrive to Maldives, so that they could provide the best transfer option for you. 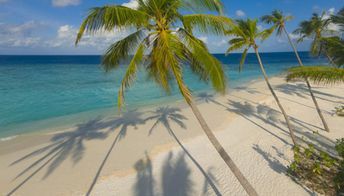 The best time for a beach holiday on Milaidhoo island in the Maldives is a dry season from January to April.